Sometime in the 12th century, a boy was born in a small nomadic tribe in steppes of north-east Asia. Little did anyone guess that this boy, born in a society which did not have agriculture or cities and grew up drinking mare’s milk, would one day unite not just the warring tribes but unify China with the Muslim and Christian kingdoms to create an empire. That boy, Temüjin — who later asked the Pope to come and submit to him — is better known as Genghis Khan. Sergei Bodrov’s big-budget movie shows the life of the most famous Mongolian till he becomes the Great Khan. The boy did not grow up amid unsurpassed luxury. Life in the steppes is hard; the Mongol tribes face extremities of weather as well as competition from other tribes for resources. Besides the usual existential threats, the boy had to face death, not once, but at least three times. Once when a rival leader takes over the clan after Temüjin’s father’s assassination, he is marked, but spared because he is a boy. This event repeats once more. The third time, as an adult, he is sold into slavery and kept in a cell with one window. He survives all adversities like Louie Zamperini, the hero of Laura Hillenbrand’s Unbroken: A World War II Story of Survival, Resilience, and Redemption. But the movie is a love story as well – between Börte whom he chose as his wife when he was 9. When she is abducted by a rival tribe, Temüjin with his blood brother rescue her. When Temüjin is held as a slave in the far away Tangut kingdom, Börte offers herself as a concubine to a merchant to hitch a ride and bribes the guards to save her husband. Börte is a strong woman which is not surprising. When the men go off to war, it is the women who watch the animals and take care of the tribe; When a Khan dies, until a new one is elected, his mother or wife is in charge of the tribe. Besides this, the Mongols are driven by two other relationships to reduce conflict. One is that of the blood brother: when two individuals from different tribes become blood brothers each one is obliged to help the other. When Temüjin was once almost frozen to death as a child, he was saved by another kid, Jamukha, who becomes his blood brother. It is this blood brother who later helps him save Börte. But these relations are not forever; it is the same Jamukha who sells him into slavery. The second relationship is with the Khan. Once someone is recognized as a great leader, people remain loyal to him. The Khan, in return for this loyalty, offers booty. A large part of Mongol life is spent in skirmishes: over women, over horses, over resources. It is after attaining freedom from the Tangut prison that Temüjin thinks of putting an end to hot-tempered personal ambitions and unifying the tribes with shared values. In the movie he does that by defeating his blood brother turned enemy Jamukha in a lavishly filmed battle scene. He also comes up with some rules of conduct — “Don’t kill women or children. Don’t forget debts. Fight enemies to end. Don’t betray the khan”. Not shown in the movie is the fact that Temüjin also used the Pakistani strategy of channeling anger towards an external enemy. It works and Genghis Khan is born. The movie ends here, but according to the reliable Wikipedia, Sergei Bodrov is working on the second part of the trilogy. 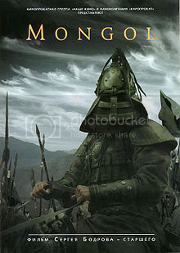 Those interested in the Mongols can also read the trilogy book by Con Iggulden. You can google the authors name for the 3 books. Nice easy reading giving a good insight into the Mongol lifestyle and Genghis Khan. For more serious readers I recommend Genghis Khan by John Man. Apart from that there is a whole plethora of books to choose from. Mongol and Genghis Khan is worth reading as it has relevance to Indian history. The Mughals descended from the Mongols thus the corruption of the word Mongol to Mughal. In fact the word Bahadur is a corruption of the Mongol word Baatur and there more many more such similarities including medieval military structure and organisation. Borte introduces a child to Temujin as his own when he had been away for years And she does that twice in the movie if I remember correctly– one of the children was due to Jamukha and another due to the merchant. Isnt it strange for a Mongol rooted in the old Patriarchial values to accept the child born of the union of his wife and another man ? Do we know anything about the Mongol perspective in this matter? Kedar, I remember Prof. Matthew Herbst talking about these kind of events in his lecture on the Mongols as part of MMW4. I can’t recollect now. I also started reading Con Iggulden’s first book and let me see if I stumble on something.